Markus Jooste whose full name is Markus Johannes Jooste is a South African businessman. 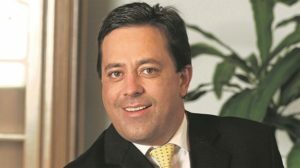 He was born in January 1961 in South Africa and he is the former chief executive of furniture manufacturer-retailer Steinhoff International as well as a patron of South African horse racing. He was born on the 22nd of January 1961. He is 58 years old as of 2019. He is married to Ingrid Jooste and together they have three children; two daughters and one son. He is married with three children, a son, and two daughters. It is believed that his wife designs the colors worn by Jooste’s racehorses. His estimated net worth was $400 million as of December 2016.